Driving this car is like driving a dream — if that’s possible. The eery silence of the motor when you accelerate to 70 or the fact that you can get to 70 in under 5 seconds alone by being held back in your seat due to the sheer power of the Model S is emphatically satisfying. With 7000 lithium-ion cells, the 85-kwH battery pack weighs more than 1300 pounds and is five feet wide, eight feet long, and a third of a foot thick. 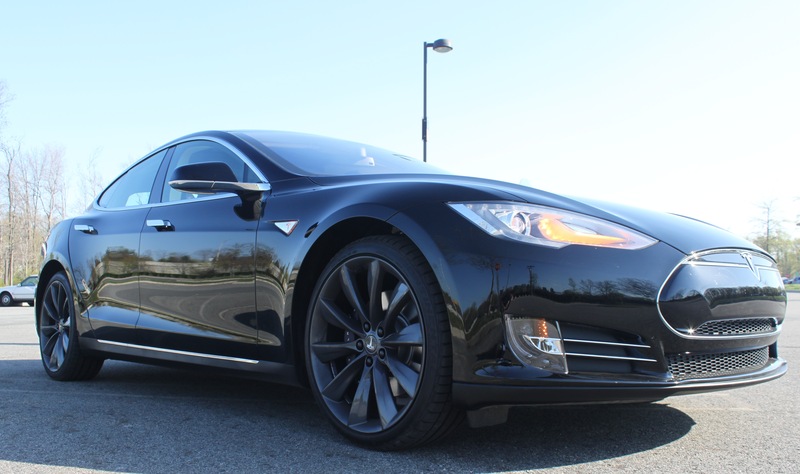 With a standard charger, the battery can be recharged in about 10 hours, however, with the Supercharger hardware (which was included with our car), you can get a 150-mile recharge in 30 minutes from any one of the Supercharges located across the US. With the base Model S starting at $62,000, additional options and battery sizes can increase the price to just into the 6-digit range. Our Model S had an as-tested price of $106,350 with options such as a panoramic all-glass roof, black performance interior with carbon fiber trim, active air suspension, dual rear facing seats (allowing for up to 6 passengers, plus driver), supercharger hardware, a carbon fiber rear spoiler and beautiful 21″ performance Carbon Gray wheels. The driver-friendly interior was accented with comfortable black leather seats, and dominated by a massive 17″ capacitive touchscreen with media, communication, cabin, and vehicle controls — it’s amazing that there were almost no buttons in this car. It also had the Tech and Sound Studio package. The Tech package includes GPS navigation system with onboard maps and free map updates for 7 years, keyless entry, high-def backup camera, Xenon headlights, LED cornering lights, power rear liftgate, GPS-enabled Homelink system, memory seats, ground lighting under door handles and electrochromatic side mirrors. The Sound Studio package includes XM satellite radio, a 580-watt 12-speaker Dolby ProLogic 7.1 sound system, and storage space for more than 3,000 songs. With a 4-year/50,000 mile warranty and an 8-year/Unlimited-mile battery warranty, you’re in good hands. There was just one drawback that we saw in the car — and that was the loose steering under heavy acceleration. Hitting the gas to merge onto the highway, we would have to compensate for steering. But, that’s it. The 99,000 other amazing things about the Model S trump that one minor issue, which I can’t seem to remember what it was anymore. Driving the Tesla Model S, truly was a treat. From pulling onto Route 208 in North Jersey and getting ripped back into the seat by the monstrous response time and torque or the massive touchscreen in the center console that controls literally everything — it was amazing. The silence of the motor and the smoothness of the ride was just so comfortable, it’s understandable why this is one of our most favorite cars. Having been presented with numerous accolades and high ratings from other journalists, this car holds a lot of promise and benchmarking for the future. Pros: an incredible amount of technology both inside the car and on the car itself; acceleration was superior to almost anything comparable; storage/trunk space was plentiful — due to the lack of an engine, there are two trunks; giant touch screen dash made everything easy to read and easy to reach; great looks. Cons: Under heavy acceleration, the car would pull in either direction, where we would have to compensate steering. We’d like to thank Stephen Martinique at Tesla Garden State Plaza for getting us into the beautiful Model S. For all your Tesla needs, go check out Tesla Garden State Plaza in Paramus, NJ and online at http://www.teslamotors.com/gardenstateplaza. Make sure you tell him Greg and Dave sent you!